There are two forms of asthma which is intrinsic asthma and extrinsic asthma. Intrinsic asthma is associated with cold, exercise and chronic bronchitis. Intrinsic asthma is commonly affecting adult. Extrinsic asthma is associated commonly in children due to type I hypersensitivity reaction. The common symptoms and signs of asthma are dyspnea, wheezy in expiratory phase, excessive use of accessory muscle and dry coughing. 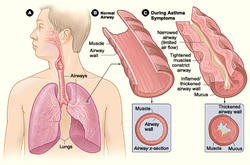 Asthma is associated with hypersensitivity of the bronchial airways. This leads to bronchospasm. There will be hyperplasia of the bronchial submucosal gland and hypertrophy of the bronchial smooth muscle. There will be reduction in the ratio of the force expiratory volume in 1 second and force vital capacity. ( FEV1/FVC). Study of the mucous plug may reveal the present of the Charcot Leyden crystal and Curshmann spirals. Eosinophil is detected in children with extrinsic asthma. Patient may present with acute asthmatic attack. The treatment for asthma may focus on the beta adrenergic agonist, theophylline, corticosteroid and cromolyn.